It’s one of the basic questions of publishing. Why should your book be read right now? What makes it relevant to your target audience? If you can answer this question convincingly, you’ll be amazed to see how many people listen to what you have to say. Two of our authors at Barlow Books are a perfect illustration of this crucial rule. Both are young—younger than the Millennials. And both have their finger on the pulse of something important in the world right now. I was thinking about this as I watched 17-year-old Clare Morneau step up to the podium at The Walrus Talks in Toronto on Wednesday night. The topic was Africa, but we in the audience were all a little groggy from the political explosion the night before. Clare told the story behind her hot new book, Kakuma Girls, which has won a coveted Heather’s Pick. This is a story of teenage girls at a refugee camp in Africa who, against all odds, dream about being a neurosurgeon or a lawyer, or about having inspired, loving lives. Dreams that we all like to dream. Clare has been on an amazing media roll. 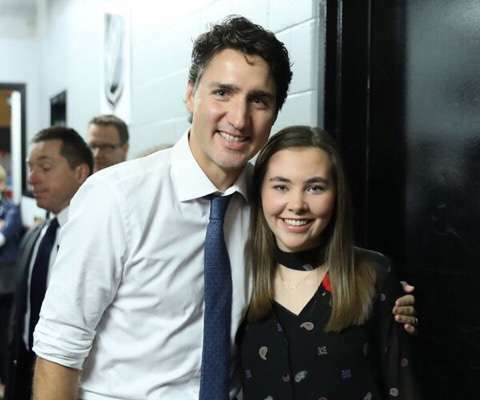 That morning, she spoke to 16,000 young people at We Day in Ottawa. She got her picture taken with Prime Minister Justin Trudeau, and entertainer Paula Abdul, whom we all loved in the late great American Idol. So why has she been all over the media? Timing, for one thing. It’s an inspired, authentic story, just what you need at a time when the world (the U.S. and the U.K.) seems to be shutting their doors to the outside world, especially places like war-torn Africa. The broad media play means that bookstores are eager to stock her books on the shelves. It’s helping Clare get her message out about the desire of the Kakuma Girls to get an education. Revenues from all books sold will go to the education of the Kakuma Girls, by the way. The other example of beautiful timing is 24-year-old Eric Termuende. His new book, Rethink Work, is hot off the press and goes on sale next February. Eric says that the impact of technology has finally changed the way we work, and it’s driving one of the biggest problems in business today—high, expensive turnover. His solution? It doesn’t really matter what you do on the job. What counts is how you work, who you work with and why. If you get it right, you’ll have a productive loyal partner at work. If not, that young person will walk out the door after two years, taking all your expensive training with him, or her. Eric is speaking all over the place these days. (He’s represented by National Speakers Bureau.) And just a few days ago, he was profiled in Forbes, the high-profile U.S. business magazine. That’s big stuff for a kid just a few years out of the University of Calgary. So why is Rethink Work so hot now? I asked Eric about that earlier this week. It may be because there’s a lag between the time the technology is introduced and when the real social impact is felt, he said. Facebook and Twitter were revolutionary, because they brought us social media. But the true impact on how we behave at work hasn’t been felt until now, when young people under 35 are the biggest group in the working world. They come to work with different assumptions—that work and life are integrated, and not separated from one another, for example. If the way they work doesn’t jive with the company’s way, it’s all too easy (via the Internet) to find another workplace that claims to offer something better. Timing counts, as Clare and Eric both show. When you write about something that your audience, whoever they are, needs to know now, they will listen to you—in traditional media and social media. ​And if they listen to you, they’ll have a good reason to buy your book.